Back at the end of July when we integrated our new pullets in with our first flock of chickens, we needed to move them all to a bigger coop. We really lucked out when David's mom gave us her huge 8x12' garden shed. After adding roosts and making a few other minor tweaks, it has been the perfect chicken coop. The only issue with the new coop has been the nesting boxes. We added a shelf with some crates, but the girls really never took to them (see the nesting boxes here). Instead, they lay in the old small coop or in what we call the hay room. Recently, Isis has even taken to laying her beautiful green eggs on top of the keet brooder where they are nearly impossible to reach! A few weeks ago, my aunt told me about some old metal nesting boxes she and my uncle had at their farm and asked if we could use them. I was excited to check them out, so over the weekend I went to see if they might work for what we need. I had the choice between one with open square boxes, or one with rounded entrances to the boxes. I thought the round one was so cute so I happily took it off their hands in exchange for four dozen eggs. These nesting boxes have been unused for many years, so I gave them a good cleaning and washing when I got home to prepare them for the coop. Sylvester couldn't resist the urge to check them out. We placed the nesting boxes on top of the existing shelf in the coop and it was a perfect fit! A few screws to mount it in place and they were good to go. I added pine shavings in each box, golf balls to show the chickens this is where they need to lay their eggs, and some marigold blooms to hopefully coax the girls to check out the boxes. There was a lot of activity in the boxes yesterday, but no eggs laid in them yet. Chickens can sometimes be stubborn when presented with changes to their daily routines. Soon enough I'm sure they will come to love their new nesting boxes. Too bad we don't get eggs from Sylvester! I swear, he must have been a chicken in a former life. Do you have any tricks to get your girls to lay their eggs where you want them to? These are very CUTE, indeed! I love the look of the circle ones you chose. I am sure that in a short time, your ladies will be laying you some delicious treasures in them. What a neat old box! Sylvester is great! I had a barn cat that had her kittens in one nest box, and the hens would sit on them and keep them warm!! The best way to get them to lay in the big girl boxes is to deny access to the old place they used to lay. That is what works for me. Keep them confined to that area at least for a day or two,. They will want to move in. They want it to be dark and quite and warm. Curtains, sometimes help, but these look like they are pretty private. Have they been mounted too high from the ground? They look like the can get in easy. I bet they will be laying in there soon. Bit try to make the old places less desirable or unaccessible. You can't beat free! Hope they take to them soon! BTW thank you so much for your kind comment on my blog this morning. May I become your newest follower? Beautiful nesting boxes! You're so lucky. I re-purposed a funky mid-century modern nightstand into a nesting box in our main coop. The ladies definitely prefer that one to the "standard" one I made out of plywood. So nice you received what you needed.. That cat is funny.. We honestly had a bunny once who thought he was a chicken.. grin.. I have heard about using the golf balls. I hope it works! your kitty made me laugh. :) good luck to your layers! I love this and your pictures.. I felt like I was there. I Love that the Cat is loving things too and the chickens dont seem to mind... YOU brought me to the country ...OMGOSH thank you !!!!!!!!! They really know of style! I like those with the circles, in no time they are going to get used to them! How nice your chickens get a stylish place to live, they will surely move in soon. Love how it all comes together...Enjoy! We have several of these old boxes my hubs picked up at an auction. Best nesting boxes ever in my opinion. LOVE the new nesting boxes- the round metal ones are so cool! Hopefully your flock will learn soon enough to lay there eggs there. And yes, chickens are SO stubborn when it comes to changes in their routine! The nesting boxes are great, the circles are perfect for having their own space and being comfy and you still being able to see them! Love this! Now they will be cozy warm in there!!! Enjoying reading your blog!! Especially about the chickens!! I want a couple, but have to talk the husband into it!! Excellent! The girls look very happy! Love those boxes. Ours won't lay where they're supposed to now either! I know absolutely nothing about making chickens lay eggs where you want them,but this is a very cute, cozy home! Maybe just a little time to settle in...? Sylvester is not about to be out-done by a chicken. Hope they learn to like their new digs. I'll admit, I don't know the first thing about chickens, but that looks like a nice place for them to lay their eggs! We have the square metal laying boxes in the left picture. Our hens took to them although I did put a egg gourd in one of the boxes for a few days. Love your blog! I love the round holes! How different. What a neat post, I learn something new about chickens. They like to golf. Have a great day! Great post love Chickens and that nesting box is wonderful. Hope they get on laying very soon. 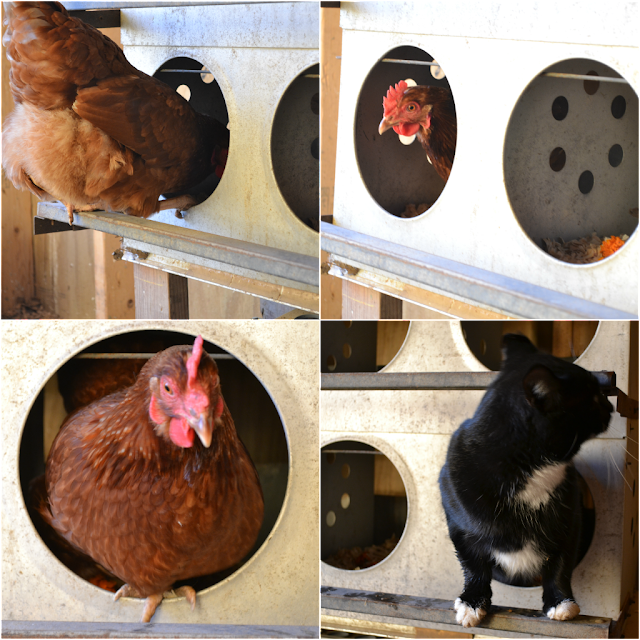 Love those nesting boxes and Sylvester is too funny, great pictures! Tammy ~ I love your nesting boxes! That is so neat that you found them within the family and were able to give them purpose again! It's finds like these, that make me want to go to auctions this summer.